Zeolites — a large group of minerals, similar in composition and by their properties, calcium and sodium water aluminosilicates from a subclass of framework silicates, with a glass or pearl luster, known for their ability to give up and re-absorb water depending on temperature and humidity. Another important property of zeolites is the ability to ion exchange — they are able to selectively release and re-absorb various substances, as well as exchange cations. Zeolites (permutites) are widely used in water purification devices as adsorbents, ion exchangers, molecular sieves; are used as electron donors and acceptors. Used in vacuum pumps of sorption type. Also, zeolites have been widely used as catalysts for many processes of petrochemistry and oil refining and as heterogeneous catalysts. 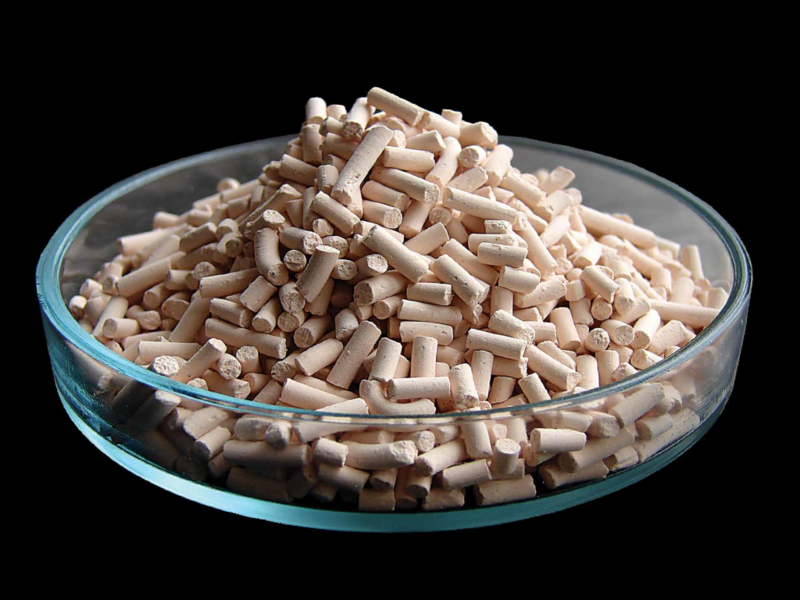 Widely used in analytical chemistry as zeolite-modified electrodes; for detection of gases; for separation and concentration methods. It is used in aquarium, as an adsorbent and ion exchanger, as a substitute or in addition to activated carbon. In addition, it is used as a filler and enterosorbent for pharmacies and dietary supplements, as well as for cat litter. Zeolite is used as a feed additive for animals and birds, replenishing the need for minerals and improving metabolism due to its adsorption properties. As a feed additive, it is desirable to use soft zeolites (Lomontite), since solid varieties (clinoptilolite) can irritate the gastrointestinal tract. Zeolites are widely used as a replacement for phosphates in washing powders. Mineral elements appear in mineral fertilizers — Mn, Mg, Fe, B, Co. The number of females is 11%, the live weight of the litter is 3-14% . The litter humidity of 25% is achieved in 2 days. Reduces the binding time — beginning 1.5 hours, the end of the 3 hours. Increases grade of cement for 30-40 units. Purification of water from suspended solids, heavy metals, ammonium and so on, reduction of water hardness. Natural zeolite is used as a filtering load at water treatment plants. It has sorption properties for almost all metals. In connection with the introduction of new requirements for purified water (in particular, for the content of strontium), this direction of zeolite application becomes urgent. The sorption capacity of the zeolite-bearing rock over the strontium ion under dynamic conditions reaches 0.66 meq / g. Other things being equal, the zeolite load at the wastewater treatment plants has a smaller volume compared to other loads. Zeolite is also an enterosorbent and serves also as a filler of tableted forms. In the TORtec Group, 14 variants of fillers (matrices) for tableted forms and medicinal capsules have been developed. Examples of new sorbents, which showed unique opportunities after mechano-chemical activation by TOR technology. A number of sorbents undergo further study and certification in the direction of decontamination of radioactive contaminants, restoration of water from biological contamination by consecutionhormones and antibiotics, chemical compounds and heavy metals.